The Bloodhound SSC is designed to go up to speeds of 1,000mph, covering a mile in just 3.6 seconds. The tail fin is a vital part of the supersonic car, providing stability that can withstand the use of both a jet and a rocket to produce more than 135,00bhp. Following stress and load testing of the fin prior to trials, the wide format specialist wrapped the fin in Avery MPI1104EA cast white vinyl, using their HP Latex 570. The design featured the names of 36,110 people who have sponsored and contributed to the creation of the Bloodhound SSC. The flag design was put together using InDesign and scaled to fit the 3.2x1.8m substrate. Using an HP Latex 570 printer, it was applied to Avery MPI 1104EA cast white vinyl self-adhesive cast film using six colours - CMYK plus light cyan and light magenta. Once printed, the substrate was laminated using a Crest laminator and taken to Bloodhound's Bristol headquarters for application, where it was wrapped by PressOn staff in a single day. 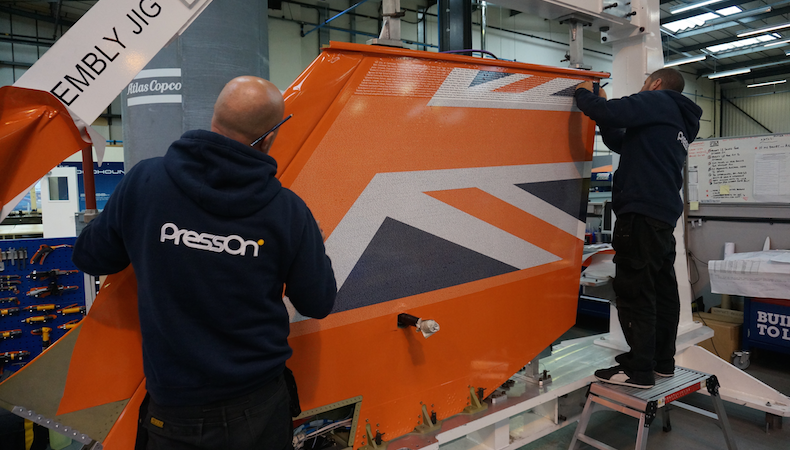 "Working with the Bloodhound team again has been an honour for PressOn," said PressOn managing director Nigel Webster. "To see the fin; a vital, expensive and fragile part of the design of the Bloodhound, wrapped in vinyl that was printed and fitted by our team has been amazing." Last year, PressOn took away two FESPA Awards prizes from the ceremony that was held in Amsterdam: a gold award in the Out of Home (OOH)/ Vehicle Decal category, and the People’s Choice Award, voted for by industry peers. Joint managing director Andy Wilson, who attended the gala dinner, said their success at the FESPA Awards has boosted their credibility and visibility, as well as bolstered staff morale. PressOn joint managing director Andy Wilson collects his award from renowned screen printing artist and FESPA founder Michel Caza. “Winning has had a big impact on the guys back in the factory. When we do prestigious projects such as wrapping buildings like Harrods and The Ritz hotel, sometimes we take for granted the impact of our work. But winning this prize shows true recognition from other people in the industry and reinforces the quality of our work." The FESPA 2018 Awards are open to all printers and signmakers who have produced quality projects with technical expertise relevant to the application. Entries will be judged on technique, colour appearance, image definition, job complexity, use and creativity. The full list of awards criteria and judging deadlines can be found here. All shortlisted entries will also be displayed at the Messe Berlin during FESPA 2018, global print expo, from 15-18th May, and the winners will be announced in front of an elite audience of global industry experts at FESPA’s Gala Night on Wednesday 16th May. Act quickly; there are just two months to apply. The closing date for entries is 26th January 2016.